If it's not on your bucket list—it should be! As a scuba diver, if Silfra isn't on your bucket list, it's probably because you haven't heard of it yet! With visibility over 100m, you really have to see it to believe it! It’s surely every diver's dream to experience water that clear, giving viz that can only be compared to the best HD experience that the best technology can provide! Silfra is a world-famous dive site located in Iceland, about 54 km North East of Reykjavik. The site can be reached in under an hour if the roads are clear of snow. The dive site is a water-filled crack between the North American continental plate and the Eurasian continental plate. The Silfra Tectonic Fissure is unique to Iceland. Nowhere else on the planet can a person dive in crystal clear water between two tectonic plates. The water is runoff from Lángjökull glacier, which filters through lava for 50km, taking 30-100 years to complete the journey. Being underground for so long, the water emerges with a constant temperature of 2 degrees Celsius. As there is a constant flow of water, there is a slight current throughout the dive site. 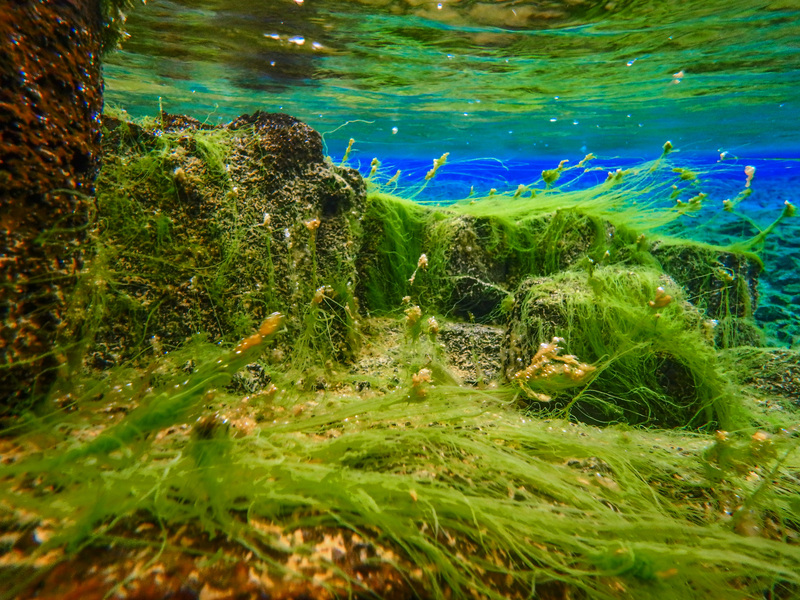 This constant, weak, current takes anything that falls into the water or sediment that is kicked up by a diver or snorkeler out into Lake Thingvellir, leaving Silfra with perfectly clear water again almost immediately. Due to the crystal clear water, there is nowhere for fish to hide from predators, and so you will be incredibly lucky to spot any. They, instead, swim happily in Lake Thingvellir. Generally, the only life to be seen other than divers are the ducks that dive down to peck at the algae on the rocks. It’s definitely a great sight to see ducks swimming in water as they use their wings for propulsion. A few years ago we had the privilege of working for a dive center here over the summer months and it was our job to guide divers and snorkelers through the fissure. Being so far north, we couldn't resist diving at midnight during the period of 24-hour daylight in June. The chance to dive at night, with no torches, was not only a novelty that we couldn't ignore but also an opportunity that very few people will ever experience. This is not something that most of the dive centers offer and so we felt incredibly privileged to have this chance. To mark this occasion, we did a little dance in the car park prior to the dive! We also took the time to really admire the scenery and take in the sights around us. On the night that we chose for our dive, a paraglider also chose to experience the midnight sun. He flew over our heads and we exchanged pleasantries before he flew off again. The colours of the sky would suggest that there was a sunset, but in reality, this blended straight into a sunrise. When we had assembled all of our kit, done our buddy checks, and double checked everything, we walked the 100m to the dive site entry point and again reveled in how bright everything was. What we weren’t prepared for, as we dipped under the surface just before midnight, was that everything would be even brighter under water. Going underneath was like someone had flicked a light on! The water was ridiculously clear, the rocks were almost glowing, and our smiles were enormous. We floated without a care in the world along with the current, enjoying the solitude of the dive and each lost in our own thoughts and wonderment. Silfra is split into four main sections, each with its own atmosphere and different topography. Transitioning from one section to another requires divers to almost surface as you pass over the separating rocks. Although the depth of the site can reach 40m, there are undercurrents in the first section which should be avoided, and descending and ascending so frequently is not considered best practice for safety reasons. This means that the maximum depth throughout a dive here is about 10m, which requires great buoyancy control in a dry suit. As you transition from the Shallows to Silfra Hall there is a very narrow gap in the fissure and this is the perfect spot for having a photo taken of touching two continental shelves at the same time. Nowhere else in the world is this possible underwater! I personally love entering Silfra Hall as the ripples from the surface make dancing light patterns on the rocks and this section seems brighter than the previous ones as the fissure becomes wider and more straight sided. Once you enter Silfra Cathedral, you can see 100m to the Sand Slope at the far end and it’s in this section I have often seen birds swimming. Good buoyancy skills are essential throughout the dive, and towards the end of the site a final ascent is required up the Sand Slope. Expanding air needs to be vented from your dry suit at this stage, prior to swimming left, exiting the current, and heading to the Lagoon. To the far left of the lagoon is another, much smaller, fissure which loops around towards the exit platform. From this fissure, you can clearly see the wall at the far right hand side of the lagoon, some 80+ meters away. The water is so clear, it makes everything look a lot closer. It isn’t until you see the same distance out of the water that you realise just how far away things really are. To finish the dive off, I hovered on my back and blew air rings up to the surface. Three very happy divers then exited the water and high fived our unforgettable experience. Even in a dry suit, with thermal layers, a thick hood, thick socks, and dry glove,s my extremities and face still got cold. The 400m walk back to the van, carrying spare weights and the emergency Oxygen tank, is a great way to start warming up. Back at the van, we took our kit apart as if it were midday and then drove back to Reykjavik without headlights or street lights ready for a few hours sleep before getting up and doing it all again with more excited customers. I love night diving for the weird and wonderful creatures that come out to play in the dark, which are hidden or sleeping during the day. I love night diving for the fairy dust (bioluminescence) that surrounds every movement and makes the world appear to be a magical place. I love night diving with a black-light (UV) torch that makes coral look psychedelic and gives the feeling of an underwater rave. I love night diving when fish swim just above my shoulder, or literally sit on my fin in the case of one Lion Fish, to follow my torch beam and grab an easy meal. Of all the night dives I have done, and there have been hundreds, diving in Silfra at midnight will remain one of my firm favourites, even though it wasn’t dark!